Many of the restaurants on Austin Ave. in Coquitlam fall under one of two categories: extremely crowded with frequent lineups or barely alive. I've seen, on many occasions, cases where two restaurants with lineups of over an hour each surround a restaurant that is barely a quarter occupied. 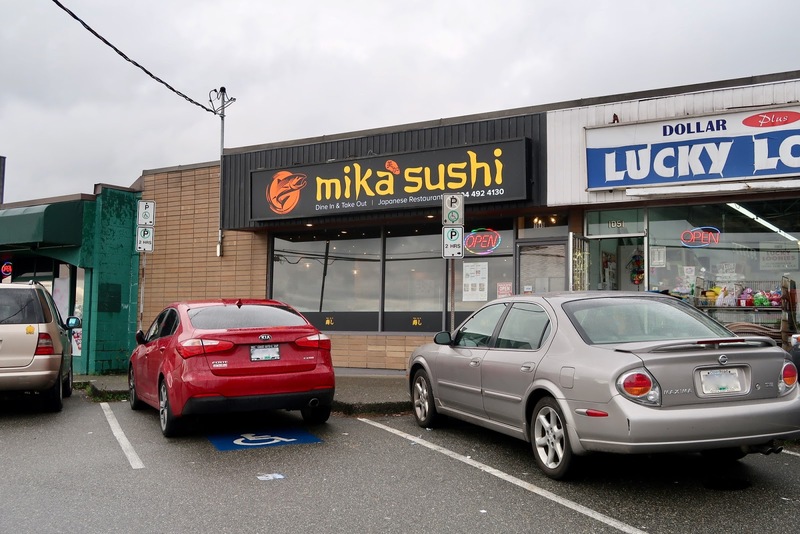 Recently, Mika Sushi replaced the second location of Nao Sushi, whose main location in Burnaby is popular for its authentic Japanese dishes. 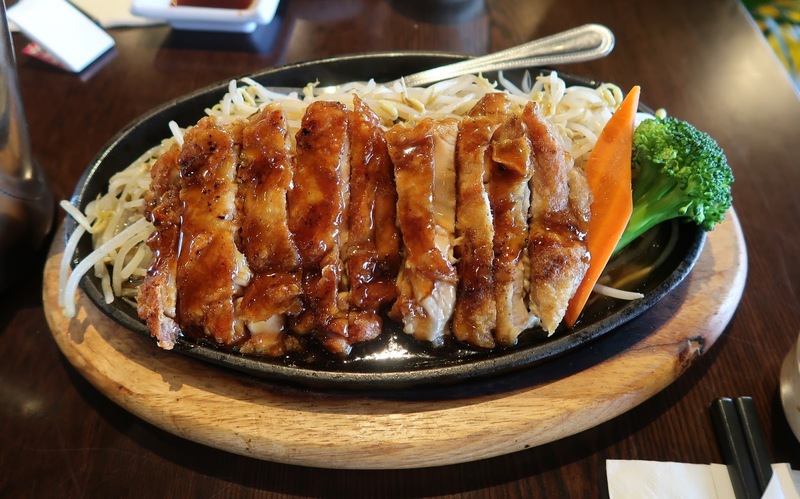 Nao's Coquitlam branch was firmly in the first category when it opened, but it wasn't long before the hype died and empty tables abounded (my guess would be consistency issues, which I experienced in both locations). 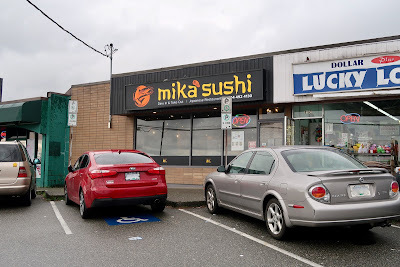 After a bout of cost-cutting measures and rude service (based on online reviews), Nao's Coquitlam branch closed its doors, and Mika Sushi took over. 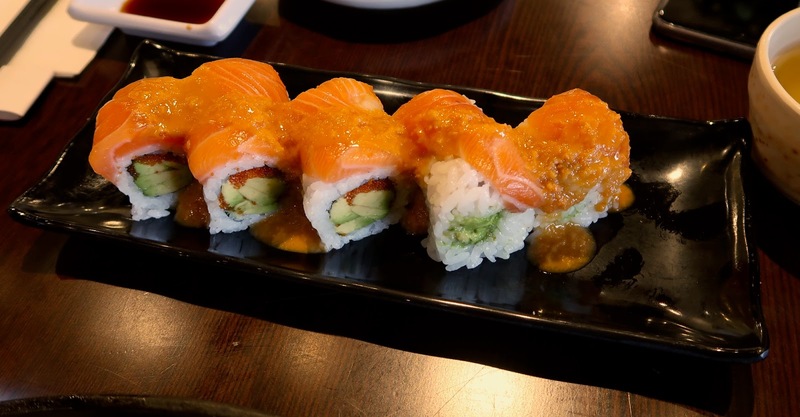 Mika Sushi is Korean-operated but retains many elements of Nao Sushi. The signage features the same colours, and both the menu and the interior decor are virtually the same. They even retained Nao Sushi's lack of customers. The atmosphere was rather quiet when I stepped in. However, with Katie as my dining partner, there is no such thing as peace and quiet. We started dinner off with Katie's favourite Japanese food—sockeye salmon sashimi. 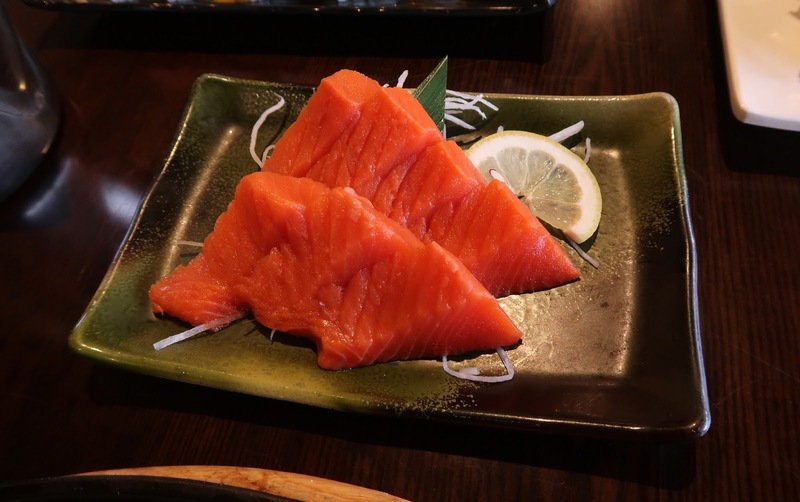 Although the cutting was a little sloppy (and strange), the salmon tasted fresh. That being said, the texture of the salmon could've been smoother. Next up was a appealingly presented plate of nigiri. The Aji Nigiri (horse mackerel) came with a slight overdose of green onion, but was smooth and fresh. The rice was packed appropriately. The Engawa Nigiri (flounder fin) also had an excellent smooth texture and a mild but discernible sweet flavour. Interestingly, they thought that one piece of flounder fin per nigiri was not enough value, so they stacked two pieces on top of each other. The Seared Toro Nigiri, one of Nao Sushi's best items, turned out excellently here as well. It was juicy and seared just the right amount. Another hit of the night was the Dragon Roll, an eel roll topped with avocado. The eel was pleasantly soft and savoury, and the avocado was dressed with a creamy mixture of wasabi mayo and unagi sauce. The sweet flavours complemented each other. The roll was a bit rice heavy, but this was barely noticeable because there was sufficient flavour. Our other roll was the Atlantic Roll, which came with avocado, masago, salmon, and a citrus-based vinaigrette. The avocado inside was appropriately soft and creamy. However, this time, the roll was noticeably rice-heavy, and the vinaigrette on top was much too acidic to work with the rest of the roll. For our filler, we had the Chicken Teriyaki, which was initially savoury with a nice thin layer of crispy chicken skin. However, there was too much teriyaki sauce, and it wasn't long before things started to turn soggy. Some pieces of chicken were noticeably tougher than others. We experienced friendly service throughout our visit. The food was modestly priced, but not cheap enough to attract diners based on just value (Mika Sushi is surrounded by budget-friendly restaurants). Like Nao Sushi in its prime days, the nigiri was solid, with the other food a little less consistent. Although Mika Sushi is decent overall, it will have to offer more in order to become a restaurant people will line up for.